There are five Important Bird Areas (IBAs) in the Malindi-Watamu area â€“ designated as such due to their international importance for bird conservation. 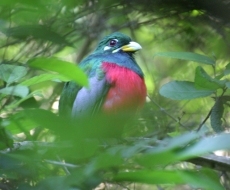 In the Watamu- Malindi area birdlife is rich and diverse. Hundreds of species are found in Arabuko-Sokoke Forest, Mida Creek, Whale Island and Malindi-Watamu Coast, Gede Ruins National Monument, Sabaki River Mouth, and Dakatcha Woodland. Migrant birds as well as local species are also found including the Osprey, Eurasian Golden Oriole,White-throated Bee-eater, Black Cuckoo-shrike and African Pygmy Kingfisher. While Watamu is good for general birding it is also recognised as an internationally significant area for several bird species and listed as "Globally Threaterned". 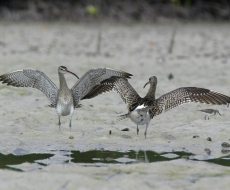 Mida Creek is an important passage and wintering area for Palaearctic migrant waders. 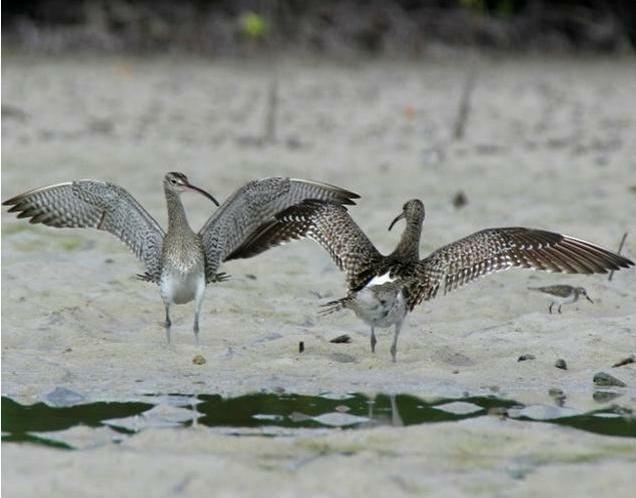 Counts of over 6,000 waders have been made on Mida Creek including seven species which are regionally threatened. The mangroves around the edge of the creek do not support large populations of resident birds but are important for roosting for certain species; migrant warblers and other groups such as sunbirds, orioles, starlings, helmet shrikes, and flycatchers use them for feeding at certain times of the year. The populations of Greater and Lesser Sandplover and Crab-plovers at Mida Creek are internationally important, and a total of 65 aquatic bird species have been recorded to use the site. The creek is a significant feeding area for Dimorphic Egrets, Lesser Crested and Roseate Terns. Common migrant shorebirds here include Sanderling, Curlew Sandpiper, Little Stint, Whimbrel, Grey Plover, and Greater and Lesser Sandplover. In the area around the creek, a further 115 species have been recorded including the regionally-threatened species Little Yellow Flycatcher. Whale Island and the coastline support significant feeding, roosting and nesting populations of terns. Roseate and Bridled Terns nest on Whale Island between June and October in most years with 1,500 pairs of Roseate Tern having been counted here. Saunders Tern occurs in internationally important numbers (over 5,000 birds) along the coastline, usually feeding close to shore and often roosting on the exposed shore at low tide. Bird conservation issues - There are few direct problems for the birds on and around Mida Creek. There is a certain amount of illegal trapping and hunting of particularly the larger water birds on the marshes just behind the mangroves. However, the major problems will be the knock-on effect in the ecosystem of over-fishing and exploitation of the marine environment and mangrove forests. Disturbance of breeding birds on Whale Island has been a problem in the past but since visiting the island has been banned without prior arrangement with the KWS Warden, this has been successfully controlled.